Percentage of Professors in different departments of colleges in New Delhi in the year 2017. In Maths department, the respective ratio between the number of female Professors and male Professors was 5:6. There were equal number of unmarried males and unmarried females in Maths department. If the respective ratio between married females and married males was 4:5, what is the number of unmarried females? 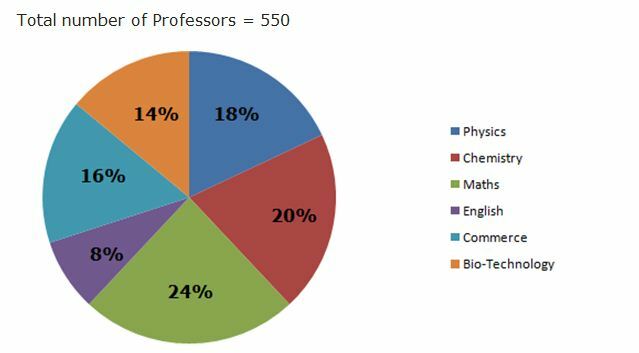 The number of Professors in English department is what percent less than the total number of Professors in Physics and Biotechnology together? In 2017, there were 30% post graduate Professors in Chemistry. In 2018, 20 Professors of the same department were shifted to ‘Chennai’. If in 2018, the percentage of post graduate Professors in Chemistry were the same, how many post graduate Professors were shifted to ‘Chennai’? In 2017, the number of female Professors in Commerce department has 5/11 of the total number of Professors in the same department. If the number of female Professors in English department was 16 less than that in Commerce department, what is the number of male Professors in English department? What is the average number of Professors in Departments Commerce, Maths and Biotechnology?